A refined and creative house design. 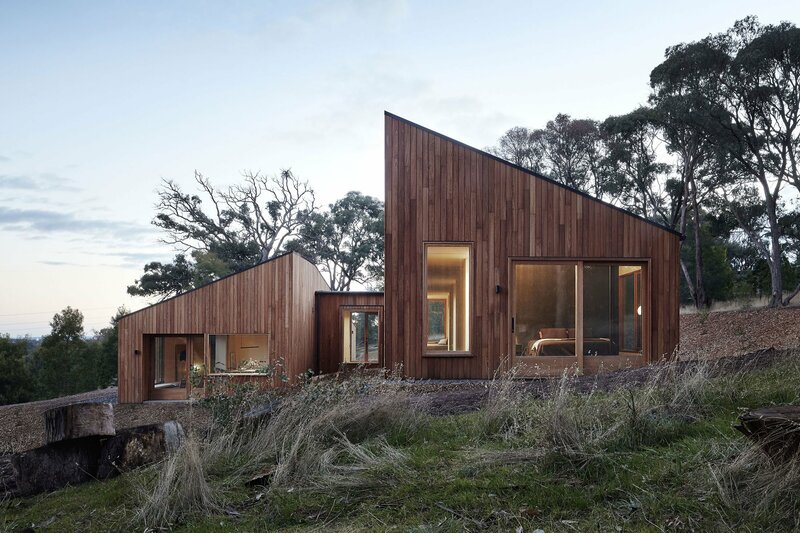 Designed by Moloney Architects with two identical volumes that separate the living spaces, this modern wood house defies convention and traditional architecture. The monolithic nature of the structures makes them stand out in the natural landscape, while their cladding helps them to blend into their environment. Beautifully integrated into the bush location, the house boasts fire-resistant Blackbutt wood for the cladding as well as on the window frames. Inside, the walls and ceilings feature light birch ply panels which give the interior a warm, welcoming look and feel. The two pavilions have the same size, but they contain different types of living spaces. The lower level houses the socializing areas; here, the open-plan kitchen, dining rooms and living room provide the perfect opportunity for family and friends to come together. The upper volume contains the sleeping areas; these feature a private, compartmentalized design that contrasts the openness of the common rooms. If the exterior of the modern wood house boasts a minimal and raw palette, the interior displays an array of refined surfaces. These include birch panels, elegant black furniture, and textured flooring. A custom steel and Paperock kitchen island bench boasts a geometric design that mirrors the angles of the structures as well as the shapes on the ceiling. Large windows and a skylight flood the rooms with natural light while also encouraging the inhabitants to gaze outside and admire the landscape. Photographs© Christine Francis and Moloney Architects.